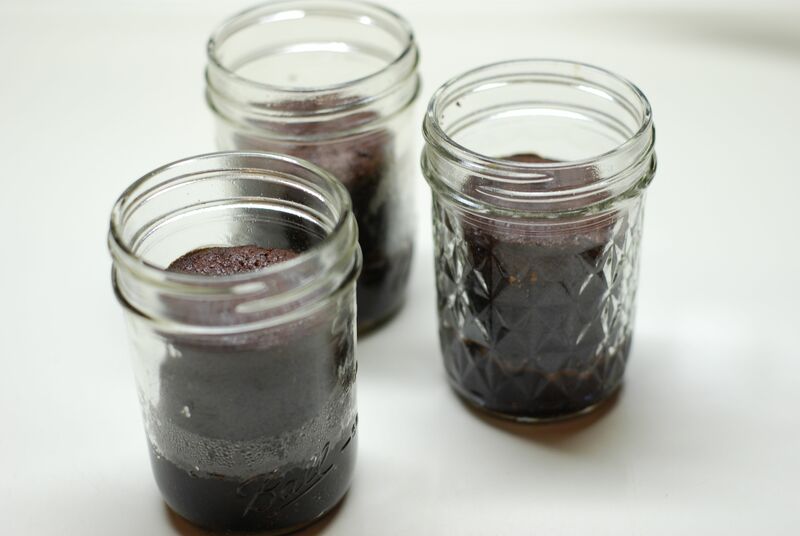 I recently came across an article online, “15 Dessert Recipes in a Jar – Cakes, cupcakes, brownies, and more by Andrea Roxas” and became fascinated with the concept of eating a decadent dessert out of a jar. I find this simple concept so much fun! It reminds me of when I was a Girl Scout and we made Frito Tacos and ate them around the campfire (taco meat filling, chopped lettuce and tomatoes, stuffed into individual serving size bag of Fritos). In a bowl, combine cocoa powder, instant coffee, boiling water, and vanilla extract. Mix until smooth. Cool to room temperature. Preheat oven to 350°. Spray the inside of the jars with cooking spray. Set aside. In a small bowl combine flour, baking powder, and baking soda. Set aside. In a large bowl beat butter with an electric mixer until smooth and shiny, about 1 minute. Add sugar and beat for 3 minutes. Add eggs, beating until well combined. Add 1/3 of flour mixture and beat until combined. Add 1/3 cocoa mixture and beat until combined. Continue to add flour and cocoa alternately until everything is incorporated. Pour ½ cup of batter into each jar. Place jars onto an oven safe tray and place in center of preheated oven. Bake for 17 minutes. Cakes are done when a long needle inserted in center comes out clean. Toppings can be added while cakes are warm but not hot. NOTE: The cakes will rise to the top but shrink down to three-fourths the height of the jar. When the cakes cool they pull away from the glass, so the toppings will drip down the sides as opposed to forming a flat layer of frosting on top of cakes. TO MAKE MINT TOPPING: In a bowl combine confectioners sugar, melted butter, milk, vanilla and peppermint extracts, and green food coloring. 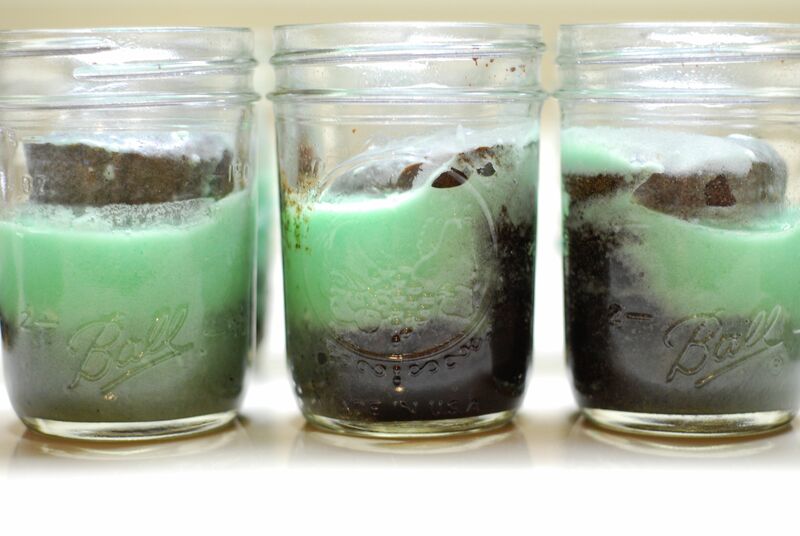 Divide mint topping among jars and pat sides of jar to help spread mint topping onto cakes. 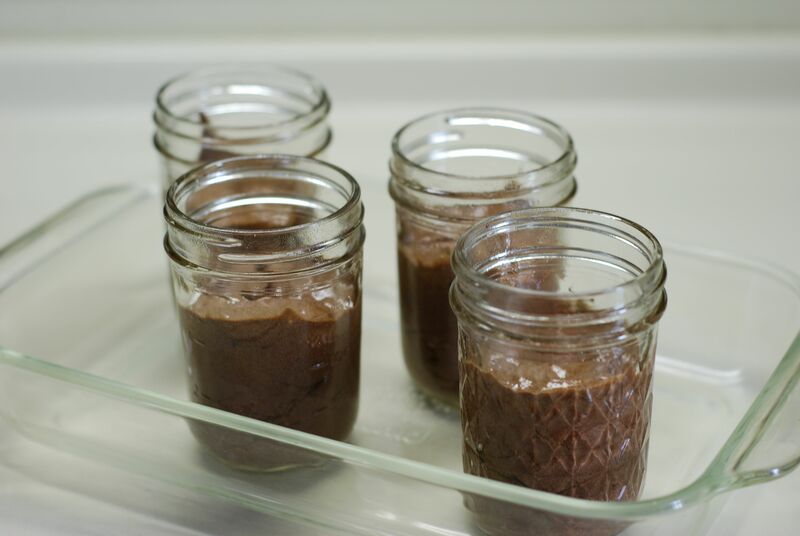 TO MAKE CHOCOLATE TOPPING: In a microwave safe bowl, combine chocolate, butter, milk, and peppermint extract. Heat on high for 1 minute. Remove and whisk until smooth. If the chocolate is not melted through, continue to heat for 15 second intervals, stirring in between, until mixture is smooth. 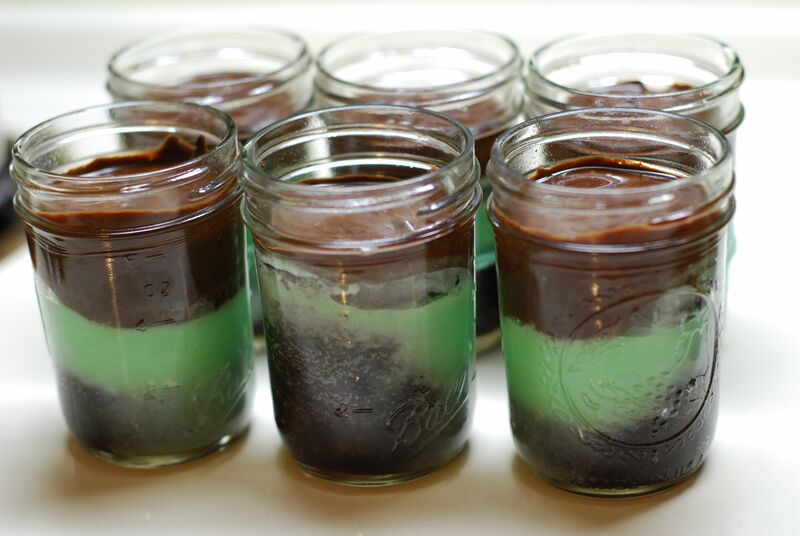 Distribute chocolate evenly among jars on top of Mint Topping, tapping sides to help spread evenly. Cakes can be served as is or cover with lids to save (3 days at room temp or 5 days in the refrigerator). For those of you who are like me and like to have an old fashion printed copy of recipes, the below link is to a PDF. 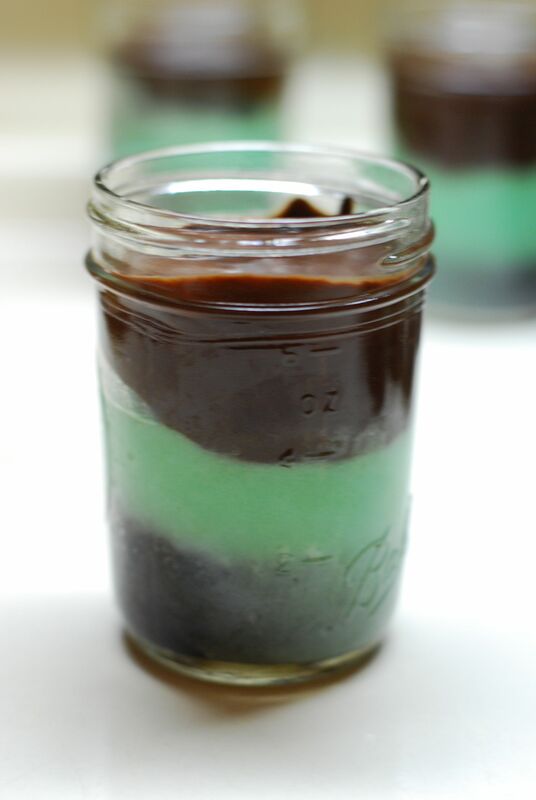 You are currently reading Chocolate Mint Cake in a Jar at Hestina's Kardia.